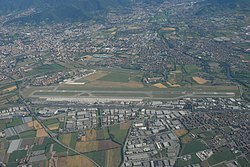 Orio al Serio International Airport (IATA: BGY, ICAO: LIME), officially also known as Il Caravaggio International Airport, is the third busiest international airport in Italy. It is located in the municipal territory of Orio al Serio, 2 nautical miles (3.7 kilometres; 2.3 miles) southeast of Bergamo in Italy. 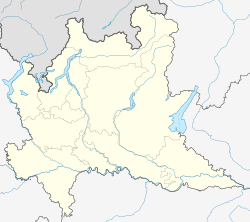 The airport is 45 km (28 mi) north-east of Milan, where it operates alongside Malpensa Airport and Linate Airport, the city's other two primary airports. The airport served 11,159,631 passengers in 2016. The airport is called Milan/Bergamo by several airlines, although neither "Milan" nor "Bergamo" are part of the airport's official naming. The airport is managed by SACBO, a company partially owned by SEA – Aeroporti di Milano, the operator of Linate and Malpensa airports. SEA, the company that runs the latter two airports, also holds a 31% stake in SACBO. It is named "Il Caravaggio" after the Baroque painter Michelangelo Merisi da Caravaggio, who lived as a child at Caravaggio in the Province of Bergamo. Ground handling services are provided by SACBO and Airport Global Services. Security services were formerly provided by SACBO with the supervision of the Polizia di Frontiera (Border Police), Guardia di Finanza (Italian Customs Police) and Ente Nazionale Aviazione Civile (Italy's Civil Aviation Authority). Due to labour disputes and costs the security services have been outsourced to a private security firm (Italpol and Securitalia). On 30 October 2005, Trade Air Flight 729 crashed near Bergamo, Italy, shortly after taking off from Orio al Serio Airport in poor weather. The flight was a night-time cargo flight from Bergamo to Zagreb operated by a Let L-410 Turbolet with the registration 9A-BTA. All three people on board, two pilots and a passenger, were killed. On 5 August 2016, during the night, Boeing 737-476 (SF) registered HA-FAX, operated by ASL Airlines Hungary, overshot while landing on runway 28 in Bergamo and came to a stop on a parking lot and on a secondary highway lane that is around the airport, 300 m from the runway end. No one was injured, but some cars were destroyed and the plane sustained substantial damages. The plane was removed from the street the same day. The air traffic remained unvaried without delays. The A4 is one of the main road networks that links the airport. There are several public transportation links to and from downtown Milan, including express coaches. There are further connections to/from Bergamo city center, Arezzo, Bologna, Brescia, Monza, Turin, Malpensa Airport, and Milan Trade Exhibition Center, Parma, Torino, Verona. The nearest railway station is Bergamo railway station, 3.5 miles (5.6 km) away. There is no official shuttle between the airport and the railway station. A bus service operated by ATB connects to the airport, about 10 minutes from the train station. ^ "EAD Basic - Error Page". www.ead.eurocontrol.int. ^ a b "Statistiche - Assaeroporti". www.assaeroporti.com. ^ a b "Orio al Serio international airport • SACBO S.p.A". Orioaeroporto.it. Retrieved 2017-04-28. ^ "TRAIL - Portale nazionale delle infrastrutture di trasporto e logistica del sistema camerale". www.trail.unioncamere.it. ^ "Bergamo airport now dedicated to Caravaggio". Best of Bergamo. 19 June 2011. Retrieved 28 March 2015. ^ a b c d e f g h i j k l m n o p q r s "TOUR OPERATOR TIMETABLE". milanbergamoairport.it. Retrieved 25 March 2018. ^ "Novaturas Flights en". novatours.eu/. ^ a b c "Flight Times". neosair.it/en. ^ a b Liu, Jim. "Ryanair S19 network additions as of 28FEB19". Routesonline. Retrieved 14 March 2019. ^ a b c "ENAC: Italy's Traffic Statistics 2011" (PDF). 2012-07-09. Retrieved 2012-12-26. ^ Ranter, Harro. "ASN Aircraft accident Let L-410UVP-E19A 9A-BTA Bergamo-Orio Al Serio Airport (BGY)". aviation-safety.net. ^ "ASN Aircraft accident Boeing 737-476SF HA-FAX Bergamo-Orio Al Serio Airport (BGY)". Aviation-safety.net. Retrieved 2017-04-28. ^ "Bus SACBO". Retrieved 25 October 2015. ^ "Train SACBO". Retrieved 25 October 2015.